Chief Rhoda Mae Kerr is a fourth-generation firefighter who recently became the first woman elected president of the International Association of Fire Chiefs. Chief Kerr has devoted herself to fire service for 32 years in departments throughout the country. After graduating from William Paterson University in Wayne, New Jersey, she started her career as an educator and athletic coach for 13 years. She then made a career change by joining the Fort Lauderdale Fire Rescue in 1983, serving in various operational and administrative positions until being promoted to deputy chief. Chief Kerr was appointed chief fire executive of the Little Rock (Arkansas) Fire Department in 2004, providing leadership to more than 400 personnel spanning five divisions. During her time in Little Rock, her team collaborated with both the public and private sectors, promoted cultural change and consistency in all aspects of the organization, and vigorously pursued firefighter safety and well-being and community risk reduction. “As firefighters, we commit ourselves to serving others above self,” she says. “But we also recognize the challenges of doing so if we haven’t looked after our own needs properly. In 2009, Chief Kerr was appointed chief fire executive of the Austin (Texas) Fire Department, overseeing almost 1,200 personnel across 45 fire stations and seven additional work sites. There she focused on providing outstanding customer service, more robust firefighter health and wellness, a culture of personal accountability and responsibility, and partnerships with community leaders, citizens, the media, and local businesses. She established an Innovation Committee to support the development of a fitness center, reintegrate active military personnel, enhance fireground safety for responders with such nationally recognized training as Rules of Engagement, ensure every operations member receives S130/S190 wildland training (the only department in Texas to do so), and install more than 2,000 smoke alarms in the community. Chief Kerr has a master’s degree in public administration and attended Harvard University for its National Preparedness Leadership Initiative. She is an active member in the community, participating on the board of the Austin Area Urban League, Operation Blue Santa, the 100 Club, and the Entrepreneurs Foundation. She has served on numerous boards, committees, and task forces, including the International Association of Fire Chiefs, Metropolitan Fire Chiefs, and National Society of Executive Fire Officers. Chief Kerr is the first women elected president of the IAFC in its 140-year history. 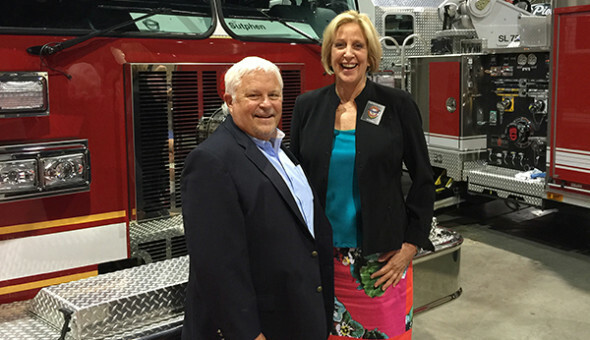 As IAFC president for 2015–2016, she plans to focus on risk reduction and fire prevention efforts such as fire sprinklers. But her top priority will be to continue to champion the National Fallen Firefighters Foundation (NFFF) 16 Firefighter Life Safety Initiatives (FLSI), a set of action points jointly developed by representatives of major fire service constituencies in 2004. “There are few things more important than ensuring the successful implementation of those initiatives,” she says.